You see them everywhere in Bangkok and other Thai cities, lining almost every road or soi, many with street-side tables offering a variety of favorite Thai dishes. Many tourists avoid them but you could be missing out on some great culinary treats. 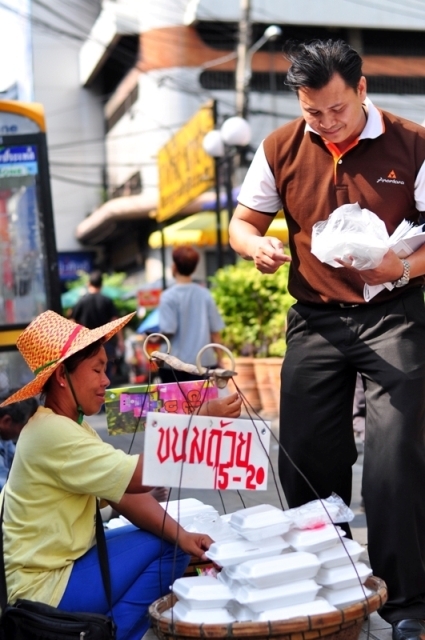 That’s where the street-smart advice of Chetta Khambunditkul, Anantara’s street-wise guru, comes in handy. Chettha has evolved his own Bangkok gastronomy hot list in the 15 years he’s been at Anantara. He is currently chief concierge at Anantara Bangkok Riverside Resort & Spa. With Chettha by your side, you can simply head straight for the places that have his stamp of approval and an insider’s special knowledge that can guide you to the tastiest roasted duck noodles, BBQ noodles, fish ball noodles and spicy tom yum soups. Chettha’s motto is “great food, great place, great company,” and he takes this into consideration when suggesting a local restaurant. These include riverside venues, where you can watch cruise boats drift by while sampling grilled seafood, rich Thai curries, sizzling stirfries and spicy herb-infused salads. He also knows the most popular Vietnamese and Chinese restaurants, often tucked behind narrow streets that you would never find on your own or to the most appealing dinner shows and liveliest karoke hangouts.